In a large pizza pan stretch out fresh dough. Let rise till doubled around an hour. Put sauce on top, sliced tomato, cooked drained meat of choice, sauteed broccoli rabe spinkle with mozzarella cheese, grating cheese and drizzle with olive oil. Bake at 400 degree hot oven until cheese if browned and bubbly. 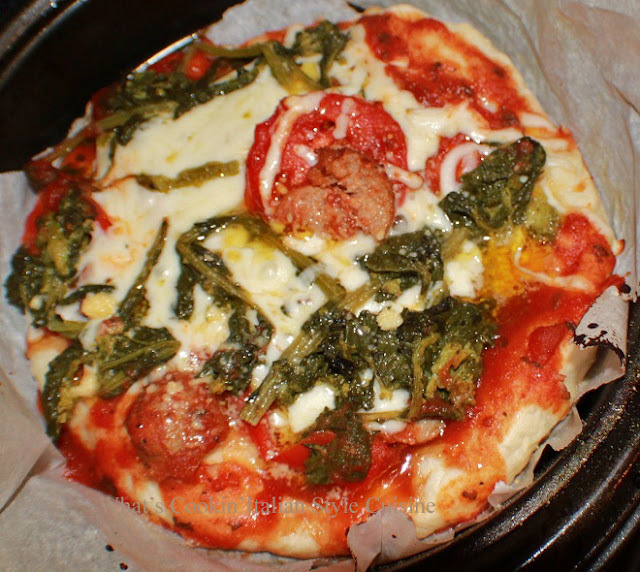 I see Broccoli Rabe in so many recipes, I'm going to have to try some - pizza looks like a good use of it. That is making my mouth water! Nothing like eating the colors of the flag. I like the idea of subbing broccoli rabe for basil, when it is not in season. solo a vederla questa pizza mi mette appetito,non vedo l'ora di provarla!!! Claudia, When I saw this pizza on today's G+ Hangout, I knew I had to come by for a closer look. The addition of broccoli rabe is a nice way to use the vegetable. Thank you for sharing the idea and the recipe! Always wondered why they call it Margarita pizza? ;) My sons and DH would go crazy over this. Simply a pizza margharita makes for a perfect evening. This looks scrumptious!